Senior leaders of Japan’s Ministry of Defense, U.S. 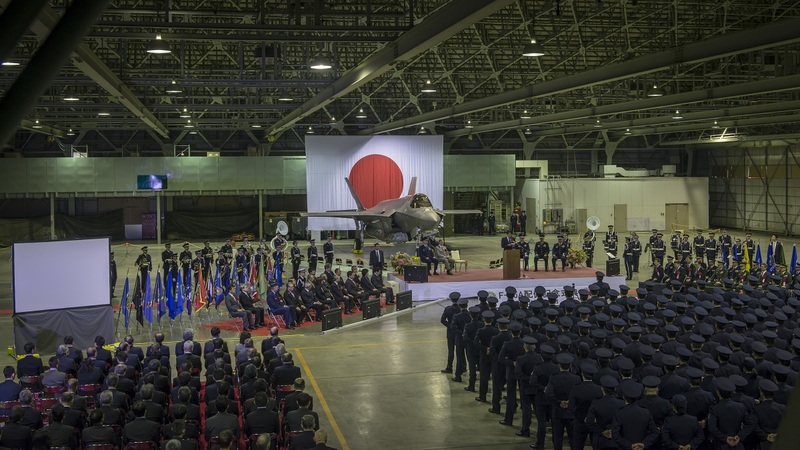 Forces Japan, Pacific Air Forces and Lockheed Martin gather in a Japan Air Self-Defense Force hangar at Misawa Air Base, Japan, for the commemorative ceremony welcoming the first operational F-35A Lightning II to JASDF’s 3rd Air Wing, Feb. 24, 2018. The F-35A is the second assembled at Mitsubishi’s facility in Nagoya, Japan. Regional leaders from Misawa City and Aomori Prefecture also attended the ceremony. According to Jane’s, Japan is paying an extra $33 million to assemble a F-35A at the Mitsubishi Heavy Industries (MHI) final assembly and check out (FACO) facility in Nagoya, more than importing the same aircraft from the U.S. The official explained that in fiscal year 2012 when Japan first ordered the F-35 through the import of completed aircraft the exchange rate was JPY81 per USD1, and that this resulted in the unit cost of imported F-35s reaching JPY9.6 billion (or USD90.1 million at constant 2018). The Japan Air Self-Defense Force (JASDF) has ordered 42 F-35As, with the initial four aircraft to be imported from the United States – the first of which was handed over to the force in late 2016. The remaining 38 F-35As are to be assembled and delivered from the FACO facility. The first of these aircraft was rolled out in June 2017. The F-35A is the conventional takeoff and landing (CTOL) variant of the fifth generation stealth aircraft. However as we have previously reported JASDF intends to replace some aging F-15Js with the F-35B short take-off and vertical landing (STOVL) variant and defense officials are mulling the exact number to buy in the next Medium Term Defense Program. The Japan Self-Defense Force (JSDF) is barred from deploying military aircraft to Shimochijima airport, which has the longest runway in the Ryukyu Islands. Therefore, defense officials are thinking of using the F-35B at airports with shorter runways.